One of the novels I wanted to read this year and got neglected in the end is Kevin J. Anderson’s “The Edge of the World”. I hope that this situation will be corrected soon because the novel’s synopsis picked my curiosity, and still does. I also liked the cover of the novel, with the artwork made by Lee Gibbons. Next year Orbit Books will release the second novel in the Kevin J. Anderson’s series “Terra Incognita”, “The Map of All Things”, and the synopsis of the second novel also pushes me to start reading the series. I like the cover for this novel as well, even a bit more than the first one, and I love that the publisher keeps the line set with the cover artwork of “The Edge of the World”. I really like the design, especially the top image which promises great things within the novel. After terrible atrocities by both sides, the religious war between Tierra and Uraba has spread and intensified, irreparably dividing the known world. What started as a series of skirmishes has erupted into a full-blown crusade. Now that the Uraban leader, Soldan-Shah Omra, has captured the ruined city of Ishalem, his construction teams discover a priceless ancient map in an underground vault - a map that can guide brave explorers to the mysterious Key to Creation. Omra dispatches his adoptive son Saan to sail east across the uncharted Middlesea on a quest to find it. In Tierra, Captain Criston Vora has built a grand new vessel, and sets out to explore the great unknown and find the fabled land of Terravitae. But Criston cannot forget his previous voyage that ended in shipwreck and disaster . . . and the loss of his beloved wife Adrea, who - unbeknownst to him - fights to survive against palace intrigues and constant threats against her life in far-off Uraba. For Adrea is now the wife of the soldan-shah and mother of his adopted son . . . 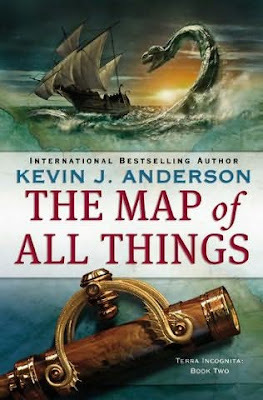 The Map of All Things continues Kevin J Anderson's epic fantasy of sailing ships, crusading armies, sea monsters and enchanted islands. Mihai, in this case we share the taste. As you may know I buy mostly paperback. And the paperback of The Edge of the World will be published in April 2010. So I sent a pre-order today. And to my pleasure the paperback of The Map of All Things will be published in June 2010. I could not resist and sent a pre-order too. I assume you own a copy of The Edge of the World. So you will definitely read an review it before I will do. I really look forward to your review.